While again fruitlessly trying to clear our archives of accumulated links, we were happily reacquainted with Richard Box's installation called Field. 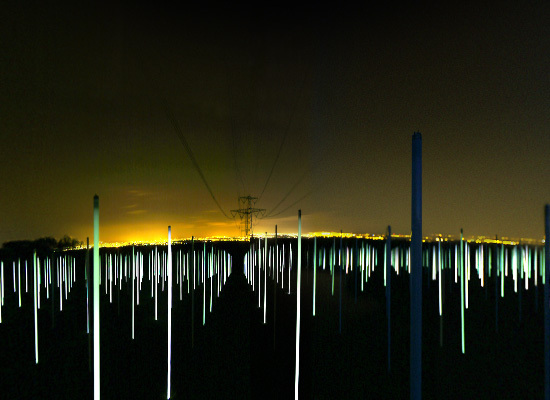 Realized in February 2004 while he was Artist-in-Residence of the Physics Department at Bristol University, the project involved over a thousand fluorescent bulbs “planted” underneath high voltage AC transmission lines. Unwired, the bulbs drew energy from the surrounding electromagnetic radiation and lit up, making for what must have been a marvelous sight. The FIELD of tubes will flicker in to life across the hillside as the early evening light fades. 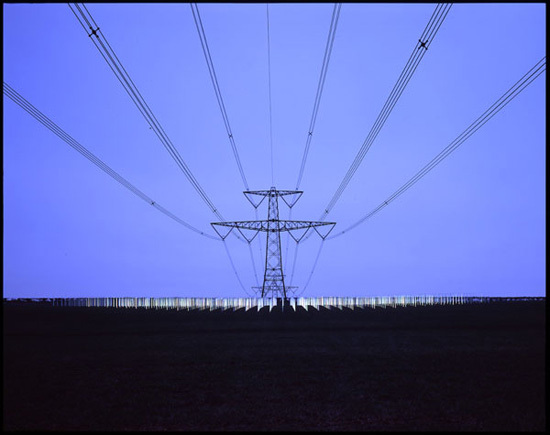 The performance each evening is hard to anticipate as the daily operation of the electricity supply will differ and is always dependent on the weather. In all the best traditions of land art it is conditional on the variations of the great outdoors, and requires its audience to be patient. Here a parallel can be struck between FIELD and Walter DeMaria's Lightning Field sited in the Nevada Desert [N.B. it's actually located in New Mexico] - many visitors travel for days to see [it], camp beside it and are lucky if they experience the sort of storm that will make the lightning dance across the 'field' of conductors. 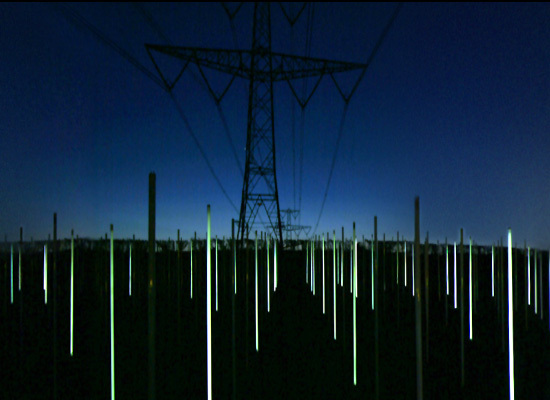 It has been remarked that Richard Box was trying to draw attention to the dangers of overhead power lines but the artist maintains that he was simply making visible what is otherwise invisible. wow..what a fantastique idea. and it looks really amazing. Here's a 12-minute video by John Minton about the project: click me. I just got this idea of installation few minutes ago... I google that idea to see if it was done before!!! Arrrg !!! It was ! And Wow ! It's marvelous !I would like to see it in real. Well, it's a little bit hard to say, but thank you. I got the chance to see this work by myself when I lived in Bristol. Quite an experience. You did have to walk a little to actually get to the site, which made the whole experience even better.